Dude, you're COMPLETELY missing Lame de Krol... Forget it, I didn't noticed that the character I see was Monk. It's worth mentioning that the 463 Blacksmithy crafted Éclat fantôme ouvragé is a dagger sheathed behind the back, although it does become invisible once sheathed. Pretty cool if you prefer both a hidden weapon + the back sheathing animation. In 5.4.8 Lame des broussailles no longer sheaths on your back. Darde doesn't sheathe on your back (anymore). Great guide! Just thought it was worth mentioning that the Porte-feu yaungol is now transmogable! Quick update for WoD, two weapons you get from doing Défi de Warlords of Draenor relevé : or sheath on your back. Namely, Gangrelame changeante and Croissant élémentaire. 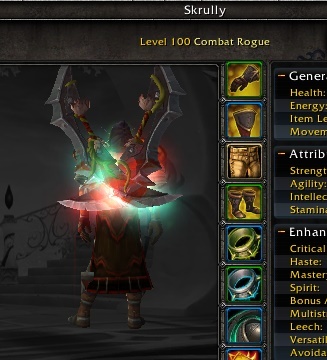 Slight Correction: At least as of a month ago, the Twinblades of the Hakkari were still in game- my hunter got the (formerly main) one-handed Lame de guerre des Hakkari Warblade of the Hakkari. 90% sure the Epée de Hanzo Sheaths on the back. This is a bit late but Gangrelame changeante also sheaths on your back. I guess if the owner of this guide ever comes back, he/she can put this under "Unobtainable." As of 7.0.3, with the new transmog system, Lourde épée longue en cuivre uses the model of Perceur sombreronce which unfortunately forces it to sheath at the hip. Trancheuse du vainqueur de l'effroi is also an axe that sheaths on the back. Coup de poing imprégné des éléments Can be Sheathed on your back as well. They are FIST WEAPONS !